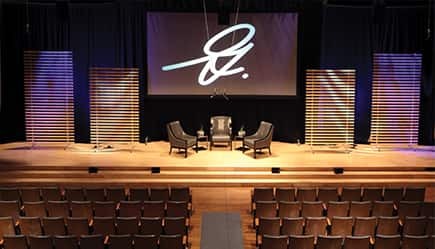 Welcome to Glenn Gould Studio. 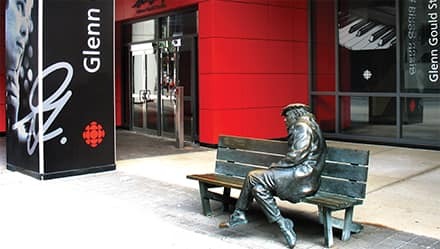 Often referred to as the "Jewel of the Canadian Broadcasting Centre", the one-of-a-kind studio is located in the heart of downtown Toronto at 250 Front Street West. Rental rates vary by room, technical support, beverage requirements and number of hours or days required. 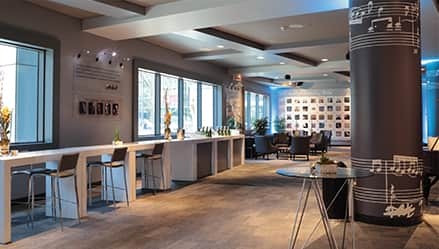 After your initial site visit and meeting with us, you will receive an event estimate. Once this estimate has been signed off, in order to confirm the booking, 50% of the total estimate is required with signed contract and a valid credit card on file. The balance is due 10 days prior to the event. Payment can be made by Visa, Mastercard, AMEX, wire transfer or cheque payable to Glenn Gould Studio. Proof of insurance is required for all events in the amount of $2 million General Commercial Liability (GCL). This is available through your insurer. For more details on insurance, please ask your Glenn Gould Studio Event Coordinator. All beverages are managed by Glenn Gould Studio Front of House team. Catering can be provided by our preferred partners. If booking is cancelled, the deposit is nonrefundable and forfeited. If the event is canceled less and 10 days prior to the event, all monies are forfeited. For all performance bookings if live or pre-recorded music is played during the Event, (Society of Composers, Authors and Music Publishers of Canada) charges will apply. All applicable SOCAN tariff fees need to be remitted by Licensee directly to SOCAN in accordance with the current conditions and tariff rates. For more information, please call 1-866-944-6210 or visit www.socan.ca for more details. Set-up is included in your rental. If early access is required, additional venue fees and labour fees will apply. All load-ins for instruments, equipment and deliveries are done via 25 John Street at the Canadian Broadcasting Centre. Please coordinate all of your load-in details with a member of our staff. The stage entrance for musicians, performers and all speakers is 25 John Street. No deliveries permitted until the day of your event. Glenn Gould Studio has a fully licensed bar under LLBO. Our alcohol vendors are Peller Estates Wines and Steamwhistle Beer. Special Occasion Permits will be permitted for registered charities and a corkage fee of $15.00 per person will apply. Substitution fees will apply to each special order beverage. A 15% landmark fee will apply to all food and catering staff. This fee will be charged by the caterers and will be remitted back to GGS following the event. Beverages can be served as a host consumption bar or cash bar. Drink tickets also available, upon request. Glenn Gould Studio prides itself with working alongside the top catering teams in the city. All food is prepared and served by our preferred catering partners.